A version of this post appeared in the October 10th edition of The Fort York Foundation’s website. For more information, see www.fortyorkfoundation.ca/. The much-anticipated Fort York Visitor Centre is now open – to positive reviews. 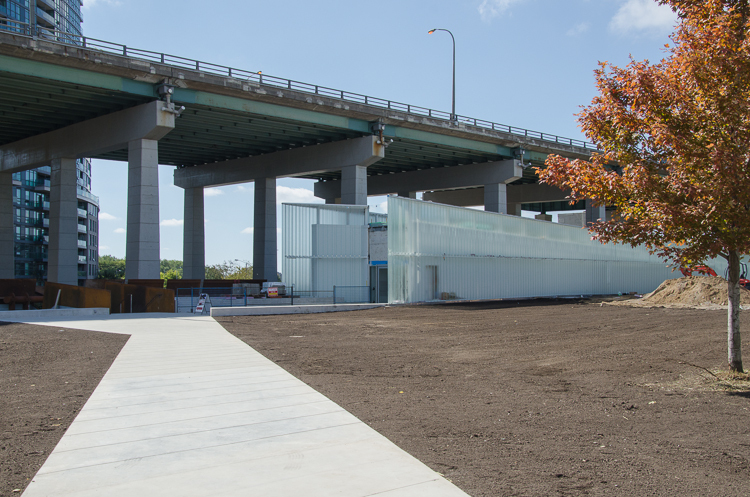 The long, linear building recreates the lakefront bluff that defined the Fort’s 19th century geography and has taken root below the hulk of the elevated Gardiner Expressway. Its main exterior façade is composed of a sequence of monolithic weathered steel panels and a ”liquid landscape” of meadow plants, aligned with the contours of the original shoreline. The Visitor Centre inhabits the space behind this industrial escarpment, partially buried under the Commons. It is an ingenious approach to working with the landscape as a form of historical narrative. Forecourt space will be planted in tall grasses with boardwalk circulation routes, recalling the original lakeshore landscape. Photo by Stephanie Calvet. The building is a joint project by Vancouver’s Patkau Architects and Toronto-based Kearns Mancini Architects – the result of an international competition held in 2009. There is a remarkable similarity between the winning competition drawings and the final building. This is rare. Although the project underwent a comprehensive value engineering process, the original concept was not diminished nor was a more conventional approach to design taken. Conceptual Sketch of the steel escarpment. Image courtesy of the project team. The ‘fortified’ edge of the site is defined by steel panels. Photo by Stephanie Calvet. A very rich landscape idea was presented as part of the winning submission, reflecting the historic harbour and telling the story of the site. Budget constraints, however, made certain key features undeliverable. These enrichments can be added as more funding becomes available. To complete the weathered steel façade, an additional 37 inclined panels need to be installed. This extension of the wall from the east end of the Visitor Centre would demonstrate how the natural escarpment contributed to the Fort’s defences. As part of the liquid landscape, expanses of softly moving grasses will continue all the way along this steel edge, creating the illusion of the lake that, until the 1850s, came right up to the Fort itself. A series of illuminated raft-like objects and boardwalk circulation routes will help recall the former presence of the lake. 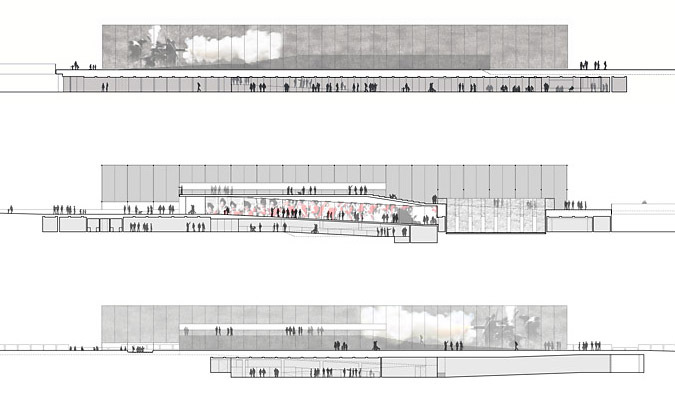 The full master plan also calls for a large terrace –”Events Dock”– reaching out into the liquid landscape. This will be the site for a slew of activities and here, at its highest elevation 20m up, the massive concrete and steel overpass will act as a huge covered canopy. 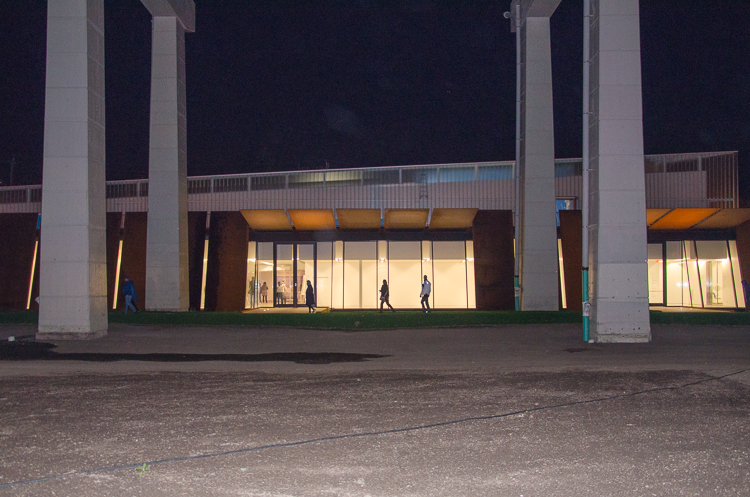 (Just this past weekend, it was the site for a video installation during Nuit Blanche.) 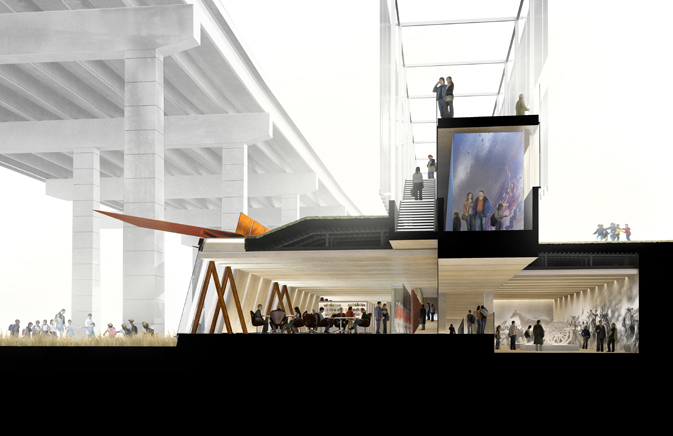 Imagine art installations hanging from its underbelly, and space for theatre, for concerts, and for kids to play. 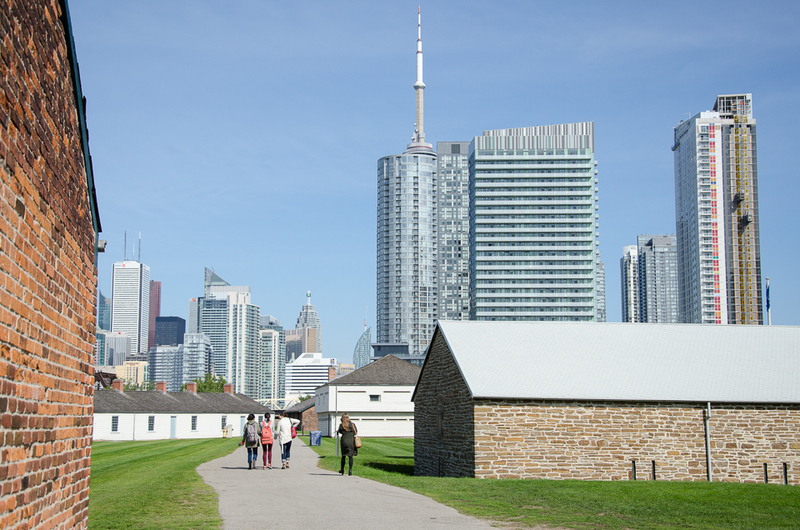 This is where the Fort York National Historic Site welcomes the modern city with diverse large-scale public events. The new urban plaza will transform the previously derelict and underused space into a bright, new, urban neighbourhood amenity. Photo by Stephanie Calvet. “There is a long list of enhancements that are not essential to the scheme but will make it richer. We hope that, over time, they can be phased in,” says John Patkau. After all, these details are the elements that we interact with most closely – they are the parts we see and touch. The main façade of the visitor centre recreates the original escarpment and presents a strong elevation along Fort York Boulevard. Photo by Stephanie Calvet. The building is the result of a collaborative partnership between two innovative firms. 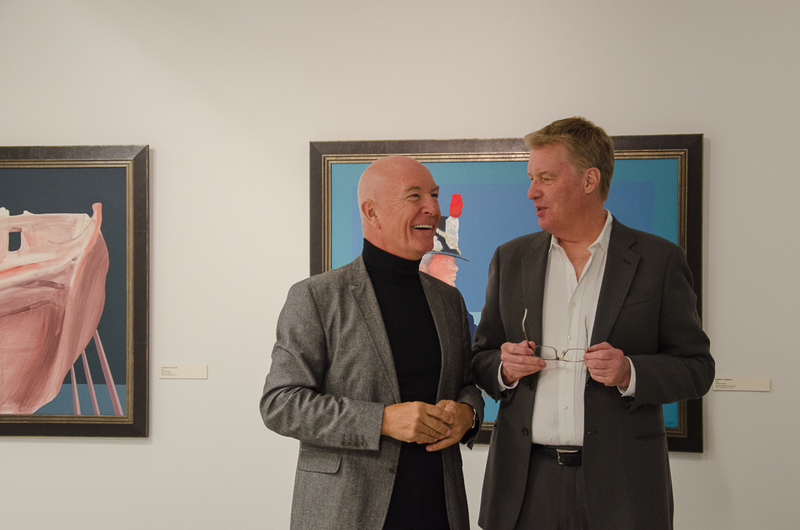 It is not always obvious how two design firms can act as a team. In this relationship, there was no ‘master sketcher’, no single person taking the lead. 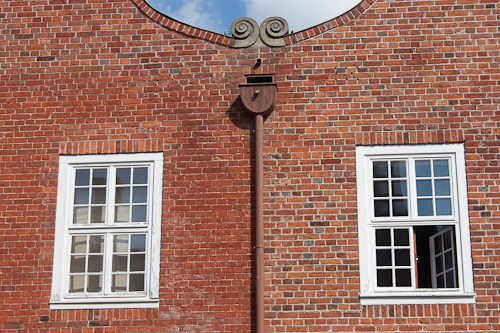 The idea of the architect as solitary genius is outdated. Instead, it was a discussion, a conversation at all stages. “It’s two complimentary, compatible design firms that are able to work together”, says Jonathan Kearns. “It’s almost like having a built-in peer review. We have a shared understanding and common goals.” Toronto-based landscape architecture firm Janet Rosenberg & Studio was also an important part of the discussion. The Fort York Visitor Centre will help Torontonians engage in the history of this site and the city. The designers, City of Toronto Culture, and community partners are committed to seeing some of the important missing elements that were described in the competition come to fruition. It’s just a question of when. The Fort York Foundation will continue to campaign and will need your support to realize this vision. 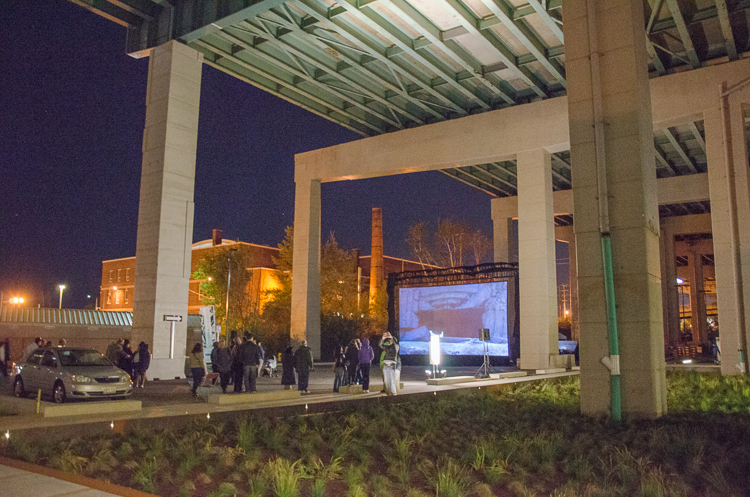 The canopy of the Expressway produces a huge, covered urban space for community events and programming. Photo by Stephanie Calvet. The project’s main façade is intimately interwoven in alternations of transparency and solidity. Photo by Stephanie Calvet. Stephanie Calvet is a Toronto-based architect and writer specializing in architecture and design. For over a decade she worked in architecture and planning firms in Boston, designing projects in the hospitality, multi-unit residential, education and healthcare sectors. In addition to consulting, she writes for the popular press, trade publications, corporate organizations, and academic journals. A version of this post appeared in the October 6th edition of UrbanToronto. Shadowlands Theatre performers take visitors on a journey through June Callwood Park. Photo by Stephanie Calvet. There’s a new kid on the block. And it’s kid-friendly too. 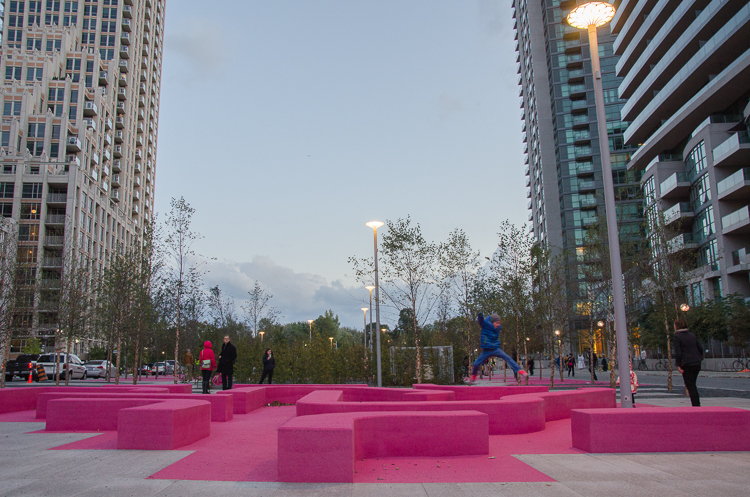 On Saturday October 4th, Fort York neighbourhood residents and those from beyond gathered to welcome a much-anticipated public space at its heart: a new urban park with a richly varied forest and striking pink covering. 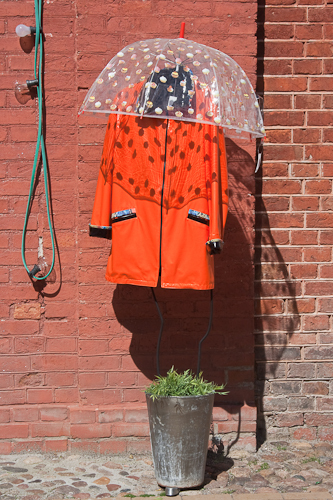 June Callwood Park injects colour and a dose of street life into the urban landscape. The festivities celebrated the opening of the park and the legacy of June Callwood, one of Canada’s leading social activists who passed away in 2007. 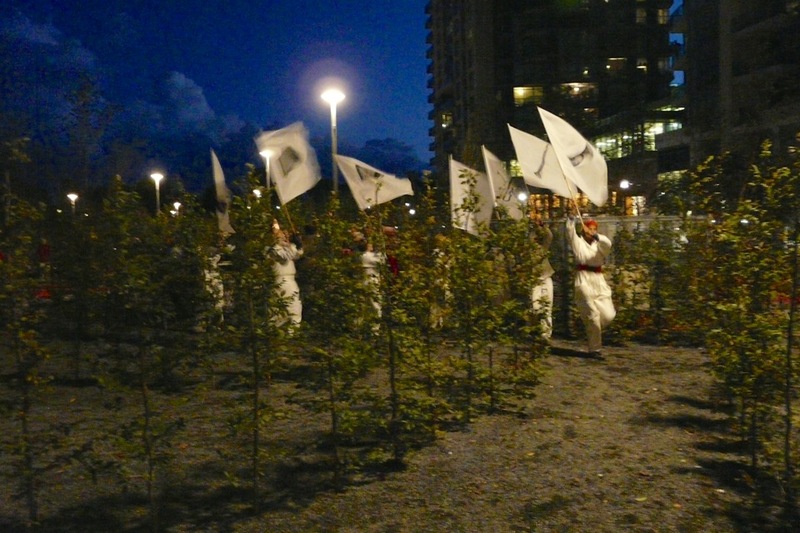 Coinciding with the kick-off of the all-night art crawl Nuit Blanche, City of Toronto officials in partnership with the Garden Club of Toronto welcomed the gatherers. Following a short speech by Callwood’s daughter, author Jill Frayne, and an appropriately floral ribbon-cutting ceremony, local art group Shadowlands Theatre engaged the crowd in a performative experience, leading visitors through an interactive tour of the park’s features. Exploring The Maze with Shadowlands Theatre performers. Photo by Craig White. 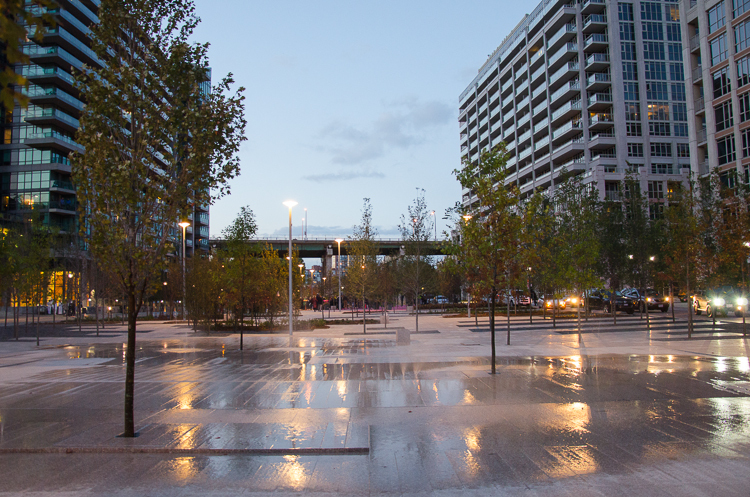 The park is located amidst a quadrant of tall condo buildings on a wedge-shaped corridor spanning from Fort York Boulevard to Fleet Street. It is a key element in reconnecting the Fort to the Lake Ontario shoreline, which has incrementally moved south with infilling over the decades. 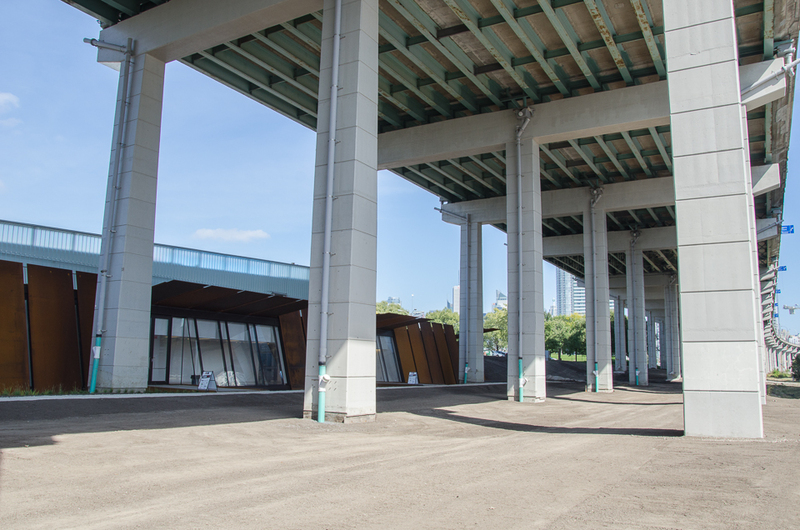 The area has seen rapidly increasing residential density —including a growing number of kids— and, most recently, has garnered additional attention with the unveiling of the Fort York Visitor Centre. Dedicated in 2005, the new 0.4-hectare park honours Callwood’s role in the development of social aid organizations and her fervent championing of children’s causes, through its design and art installation. The design, by Toronto-based multidisciplinary firm gh3, was the result of an open, two-stage international competition, which included extensive public consultation led by the City’s Parks, Forestry and Recreation division. Landscaped site plan of June Callwood Park. Image courtesy of gh3. 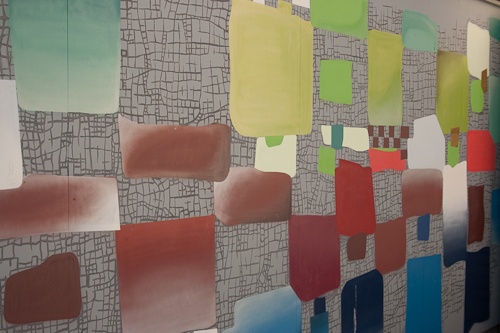 It was a visual representation of the words of Callwood that formed the basis of the winning design. During one of her final interviews she was asked if she believed in God or in the afterlife. Her response, “I believe in kindness,” is a physically mapped voiceprint whose undulations create a path running north to south through the park, with an abstract geometric pattern of clearings within the groves. It is a contemporary urban vision of a park and garden. 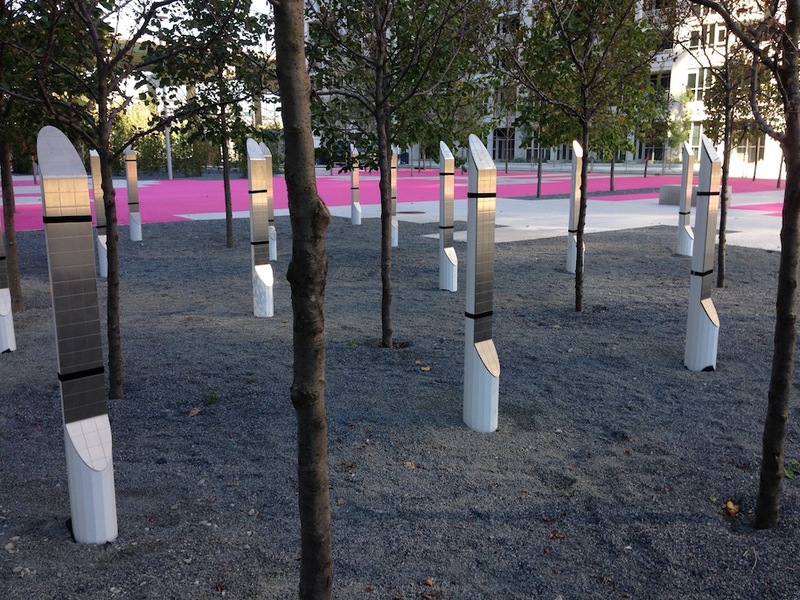 The $2.6-million park includes an ephemeral reflecting pool, granite paving and benches, pole lighting, classic wooden park benches painted pink, and bright pink rubberized benches and surfacing. The forest is planted with over 300 trees, including plantings of native Canadian tree species, a sampling of the specimens that would have dotted the shoreline at the time the area was settled. The starting point of the design takes a voice sampling of Callwood’s own words physically mapped onto the site. Image courtesy of gh3. The park is loosely divided into six clearings, each with its own unique spatial character: the Puddle Plaza is made up of depressions that collect rainwater to create splash pads; the Ephemeral Pools act as a splash pool in the summer and a mist garden in the fall; a hedge Maze; the Pink Field boasts a wide rubberized play surface; the Puzzle Garden features a series of maze-link benches; and, the Time Strip Gardens borrow from a variety of native landscape and European settlement themes. A lone apple tree —the Callwood Tree— stands at the point where all of the park’s paths converge. 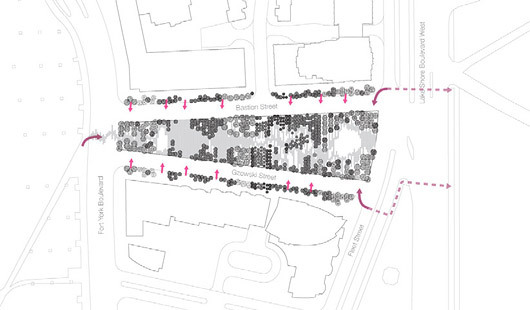 The park is a series of gestures that reads at the neighbourhood scale, and at the human scale. View northward through June Callwood Park. Ephemeral Pools at the forefront. Photo by Stephanie Calvet. 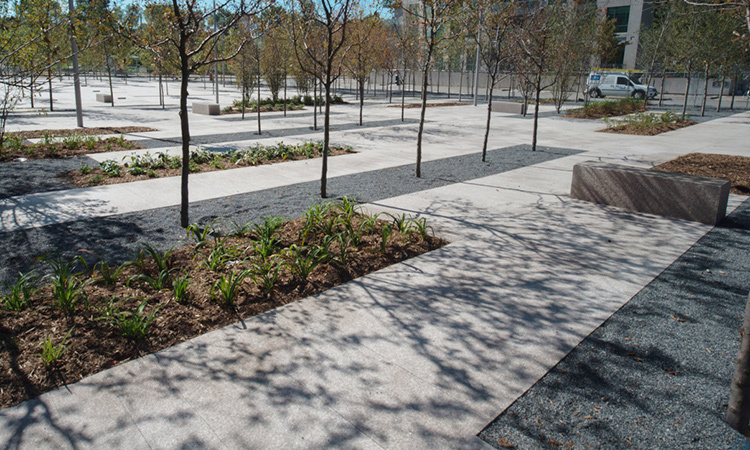 Granite pavers, trees, plantings, and fine gravel at June Callwood Park. 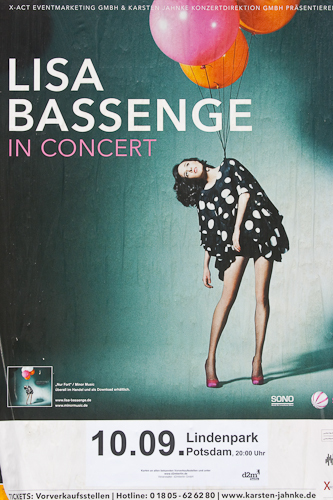 Image by gh3. Callwood had envisioned this park for toddlers and their caregivers. The new park’s spaces are open to a broader array of experiences and ageless activities that could range from tai chi by the mist garden, hide-and-seek in the maze, and lunch among the poplars. There is no grass. 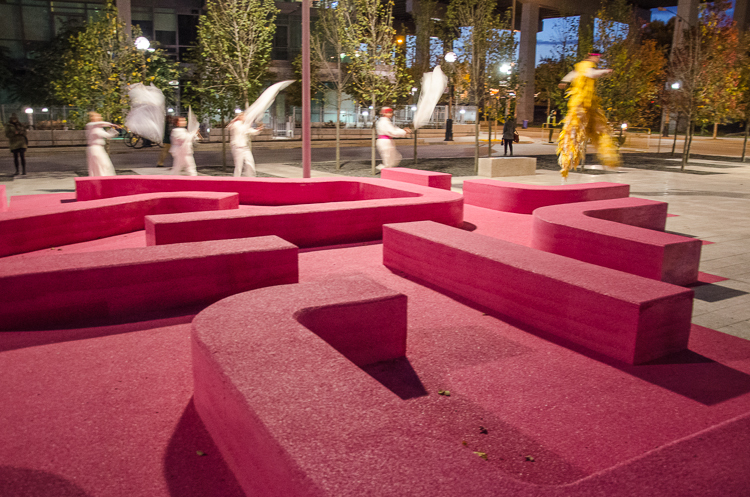 The cushioned rubberized surfacing in bright pink makes for an especially inviting playground for kids. 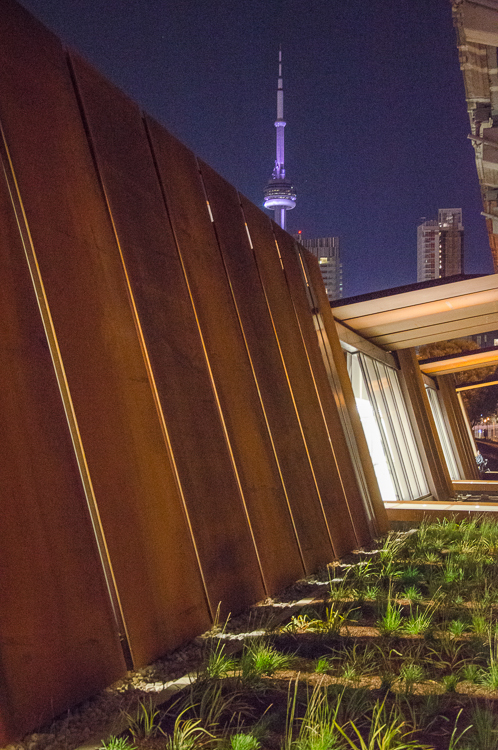 As a complement its sound-inspired layout, the park integrates a permanent sound installation – Toronto’s very first – by Douglas Moffat and Steve Bates of Montreal who work together as soundFIELD. The artists derived the concept for the innovative sound work, entitled OKTA, from Callwood’s own experiences of gliding through the clouds: “Flying is like entering another dimension where your body becomes flexible and gravity lets go. I once flew through a cloud – I thought it would be warm and fluffy, but it was ice cold. In the sky there are always discoveries,” said Callwood. OKTA is an installation where multiple points of sound are distributed across the site. A sensor aimed at the sky reads current cloud cover. The shifting shape and movement of clouds overhead triggers the sounds released across a field of 24 sculpted sound-columns, creating an ever-changing experience for the listener. 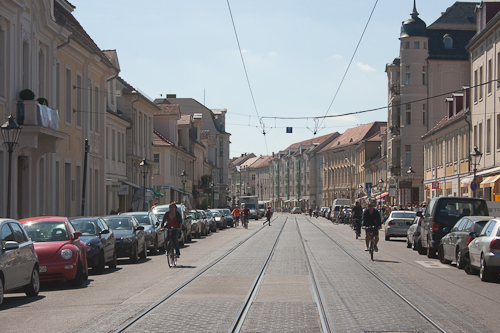 Good planning ensures good interaction between public space and the diverse nature of public life. The site, which until recently sat empty, was revitalized using open space as a physical framework and shifts from being a transit street to a destination. 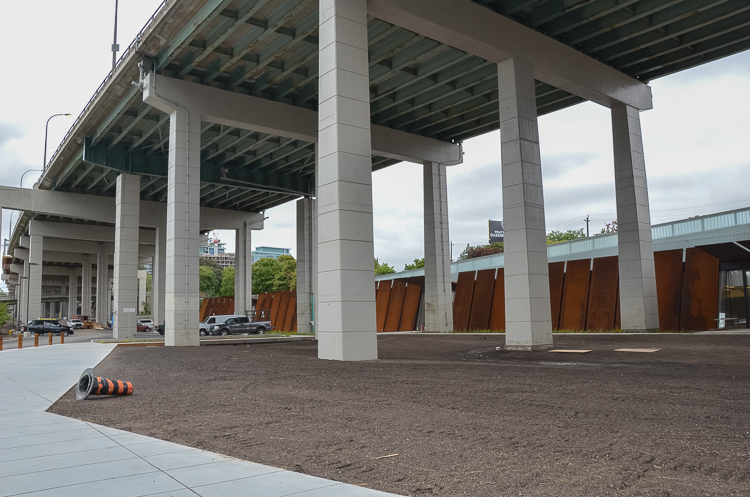 By inviting social, recreational and meditative activities, Fort York’s new neighbourhood park creates space to foster positive relationships and healthy lifestyles while also providing long-term environmental benefits. The rubberized Ure-Tech surfacing is soft, anti-slip, self-draining, and accessible. Photo by Stephanie Calvet. Snippets from the evening can be seen below. A version of this post appeared in the September 19th edition of UrbanToronto. 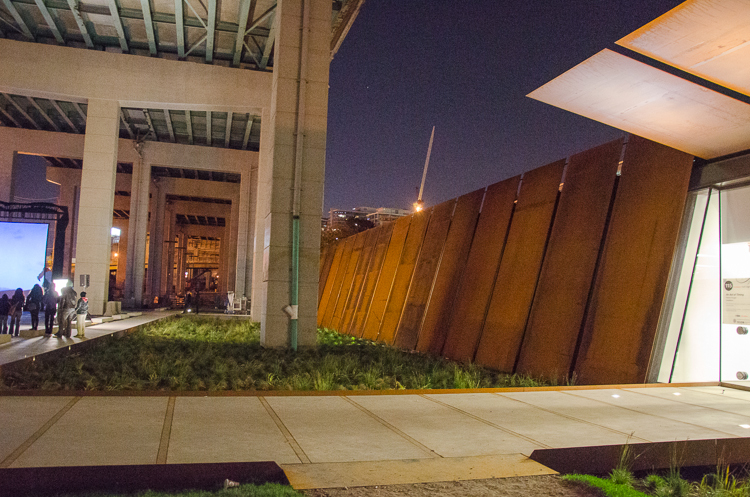 Entry to Fort York Visitor Centre, framed by a weathering steel panel façade. Photo by Stephanie Calvet. 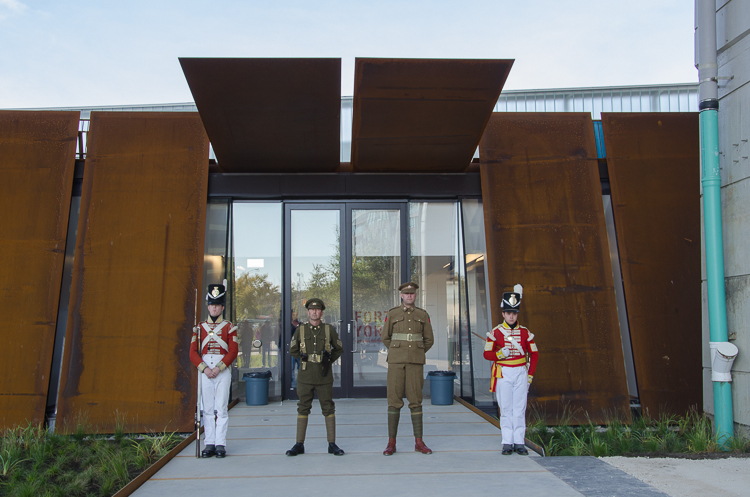 The Official Opening of Toronto’s Fort York Visitor Centre was held today. By most definitions, the city’s newest attraction, which is embedded into the ground, makes a bold statement whilst being minimally intrusive. The project is the result of a collaborative partnership between two design firms, Patkau Architects, an innovative studio based in Vancouver, and local associate architects Kearns Mancini. Fort York Visitor Centre below the Gardiner Expressway. Photo by Stephanie Calvet. The north façade of the Fort York Visitor Centre with the Gardiner Expressway above and behind. Photo by Stephanie Calvet. The Visitor Centre now changes this balance. Located on Fort York Boulevard, almost immediately below and just north of the elevated Gardiner Expressway, it acts as both a gateway and an interpretative hub for the entire 43-acre Fort York National Historic Site, considered the birthplace of Toronto. The new building is itself a key component in the ongoing restoration and revitalization of the city’s founding site, which includes not only the seven acres within the Fort’s walls but also the archaeological landscape, Garrison Common, Victoria Memorial Square, the Fort York Armoury and Garrison Creek parkland to the east. For the architects, the building was not simply seen as a Visitor Centre but an opportunity to provide a sense of connection both historically and physically with other parts of the site. The Visitor Centre’s interpretive function is a key part of a plan to revitalize the entire 43-acre historical site. The 27,000 square-foot Visitor Centre provides Fort York’s first secure exhibit space and enables the display of artifacts from the City’s collection that tells its 200-year story. Its green roof is an extension of the Common. Ground-embedding the building made it sustainable from an energy perspective and easier to develop as a Class A museum-quality interior: well insulated and unaffected by daylight. Toronto exhibit designer Reich + Petch also had a hand in shaping the environment, which includes a 2900 sq. ft. exhibit gallery; a climate-controlled vault designed to display iconic and light-sensitive artifacts; and, an Orientation Theatre. In addition to permanent and changing exhibits, it also provides facilities for education, research, staff and community use. Fort York Visitor Centre Exhibit Gallery with ‘The Vault’ in the background. Photo by Stephanie Calvet. Architects Jonathan Kearns and John Patkau introduce the Fort York Visitor Centre. Photo by Stephanie Calvet. The Visitor Centre snakes along the base of the monolithic structure that looms above. It aligns with the original shoreline of Lake Ontario, now set back some 500m, altered by two centuries of infill. Lined by a series of inclined Corten steel panels, its main façade recalls the original lake bluff, which contributed to the Fort’s natural defences. The modularity of those weathering steel panels, in considerable 8’x24’ proportions, is broken by sections of glass at building entry points. 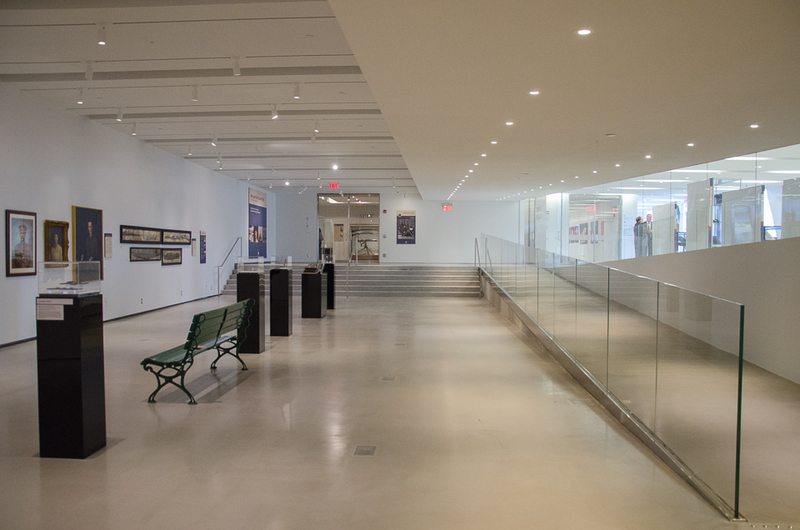 An array of glazed slits between the panels, along the length of the building, allow thin segments of natural light to permeate the main reception area and sunken exhibition gallery. The new Fort York Visitor Centre. Photo by Stephanie Calvet. Entrance points to the new Fort York Visitor Centre. Photo by Stephanie Calvet. Cross-section through the Visitor Centre. Image courtesy of Patkau Architects. Longitudinal sections through the Fort York Visitor Centre. Image by Patkau Architects. The procession through the building tells the story. The immersive “time tunnel”, a digital media space along a gentle inclined plane that zigzags back, takes the visitor through a virtual re-enactment leading up to the Battle of York. When emerging out of the end of it, the visitor is directly facing the Fort itself, with the backdrop of modern-day Toronto. Visitors can then go forth and explore the Fort, armed with a deeper understanding of its background and an appreciation of its importance as a national historic site. Existing Fort York site with Toronto’s skyline beyond. Photo by Stephanie Calvet. Hosted by The City of Toronto, The Fort York Foundation and The Friends of Fort York, the Opening Ceremonies began with fife and drum music by the Fort York Guard Drum Corps under the Gardiner Expressway. The musical prelude was followed by a welcoming and remarks by dignitaries, and then the ribbon cutting. On Saturday and Sunday, from 12 to 7pm, at the On Common Ground Festival, the public is invited to experience a free weekend of performances and exhibitions with culturally diverse music, dance, theatre, craft-making, kidzone, community village and local food. For a full schedule of events, please see link. The Centre is open but not quite finished; visitors will find that several exhibits have yet to be installed, and most of the landscaping remains to be started, let alone completed. A number of enhancements will be added as more funding becomes available. In particular, the full master plan calls for the placement of an additional 37 steel panels to recreate the escarpment, and expanses of softly moving grasses recalling the waters of the lake. 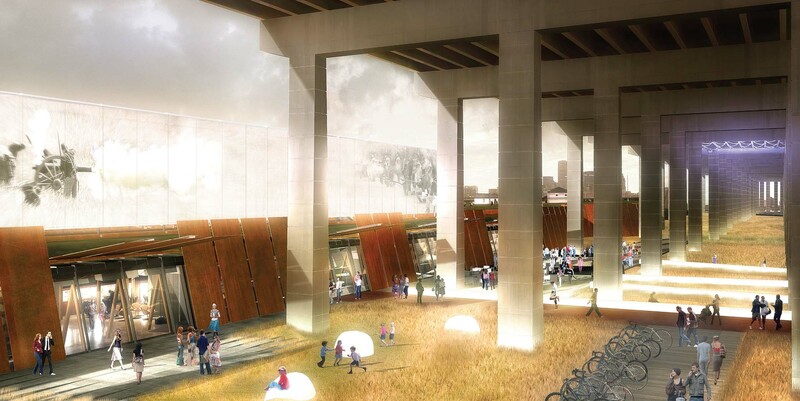 And the project team envisions the extension of a large terrace under the Gardiner that, here, at its highest elevation, will act as a covered canopy for a great diversity of public events. Still, there is much to see now, and celebrations continue. 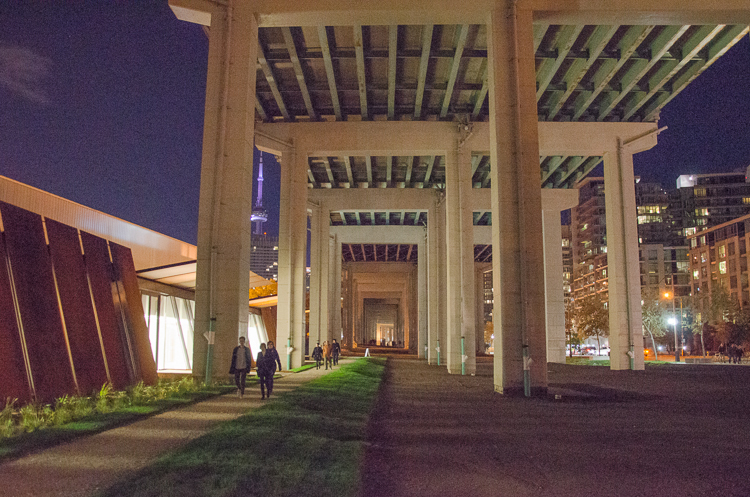 The Gardiner shelters a huge public event space. Image by Patkau Architects. South elevation of the Visitor Centre, below the Gardiner Expressway. Image by Patkau Architects. 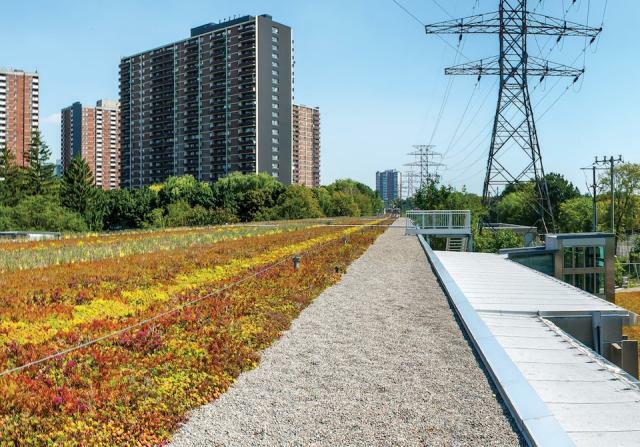 Toronto’s City Planning division has produced a new resource called Guidelines for Biodiverse Green Roofs, detailing best practices for promoting biodiversity on green roofs in Toronto. Green roofs provide insulation for buildings, improve air quality and the quality of water runoff, and cut down on the urban heat-island effect. New commercial, institutional and residential development with a minimum Gross Floor Area of 2,000m2 in Toronto require a portion of the roofs to be green. Starting April 30, 2012, the Green Roof Bylaw will require to same for new industrial development. 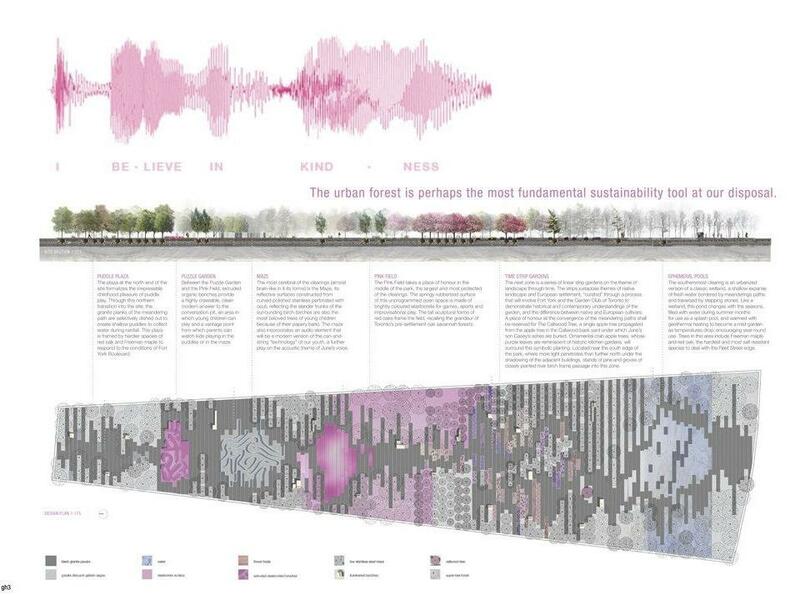 Though it may be of interest to residents, the document is primarily intended to help architects and landscape architects integrate biodiversity into their designs by providing strategies for creating appropriate ecozones alongside natural heritage features. 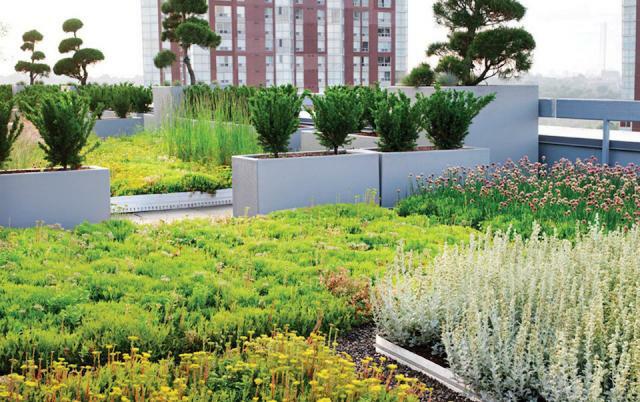 The Guidelines give designers: a comprehensive list of plants suitable for green roofs that encourage biodiversity; recommended growing medium depths and composition; and, ideas for creating habitat aimed at specific species. 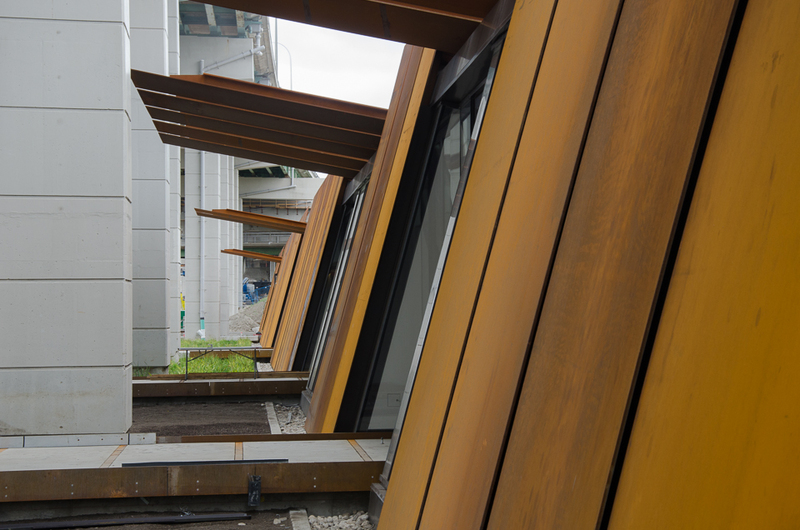 They are to be used in conjunction with the existing Toronto Green Roof Construction Standard Supplementary Guidelines. Seeing green roofs as part of the larger urban ecosystem and recognizing their ability to greatly improve the quality of life in the city, Toronto implemented its Green Roof Bylaw in 2012. “The Green Roof Bylaw and the Guidelines for Biodiverse Green Roofs are both the first of their kind from a government in North America,” said Steven Peck, President of Green Roofs for Healthy Cities, a not-for-profit association promoting the green roof and wall industry in North America. The new 35-page guidelines document (PDF) has been nominated for an Award of Excellence from the Canadian Association of Landscape Architects. A link is available at http://www.toronto.ca/greenroofs. 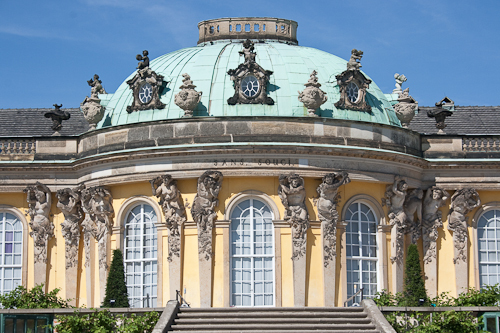 A jaunt southwest of Berlin is Potsdam, rich in history and lush in green space. 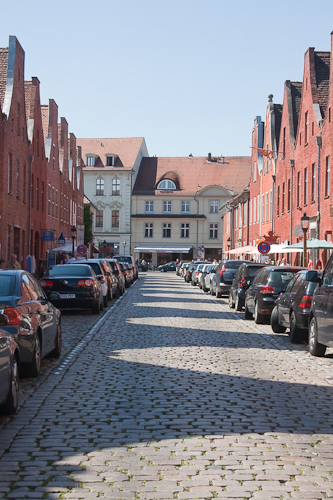 Long before it became known for hosting the Allies’ conference at the end of WWII, Potsdam was a city of Prussian royalty. 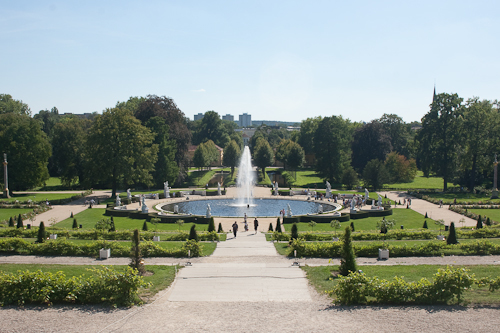 As such, it houses a beautiful arrangement of gardens and parks, reminiscent of the grandeur enjoyed by kings and emperors during the Prussian Baroque period. 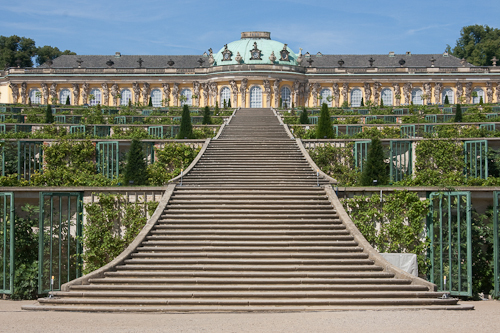 And that luxury is exemplified like nowhere else in Park Sanssouci, a triumph of architectural harmony populated by temples, palaces, botanical and formal gardens. 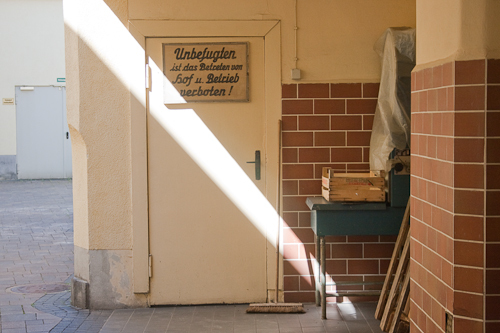 Ironically, sans souci means ‘without worries’ in French, when in fact Potsdam and its surroundings were known for Cold War intrigue and the notable exchanges of spies, particularly on the Glienicke Bridge, connecting the city to West Berlin across the Havel River. Staff members were in the midst of setting up for the annual light show, Schlössernacht (‘Palaces by Night’), the weekend I visited and were busy herding people off the grounds. (I got access, however – it’s amazing what a media pass can do.) 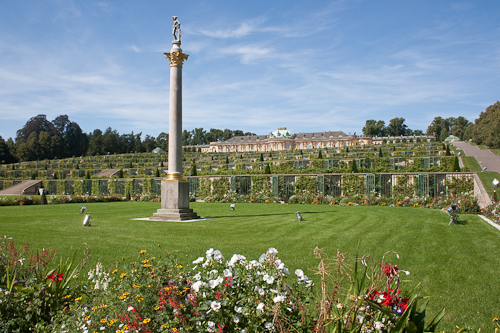 With a terraced vineyard in its foreground, Schlöss Sanssouci is an impressive summer residence that King Frederick the Great had built for himself in 1744 where he could live sans souci, in the midst of a European continent engulfed in continuous wars. 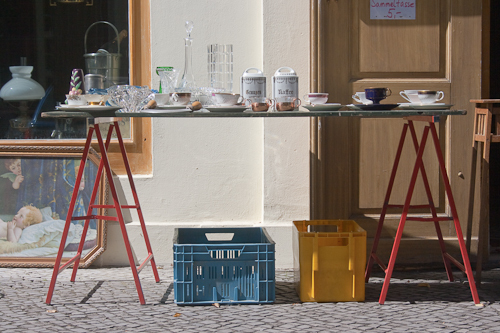 Historically a centre of European immigration (predominantly from France, Russia, the Netherlands and Bohemia), Potsdam has an international character evident in its culture and architecture. 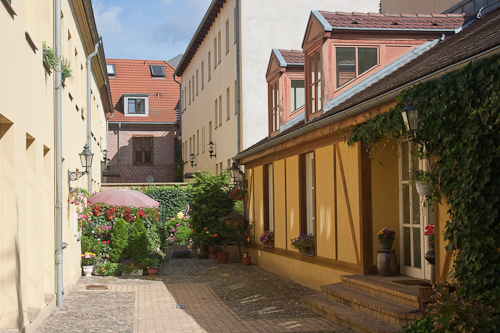 While it was severely damaged in bombing raids during WWII, many buildings in its historic districts have since been refurbished with great detail and large areas of this remarkable state capital have been granted UNESCO World Heritage status. 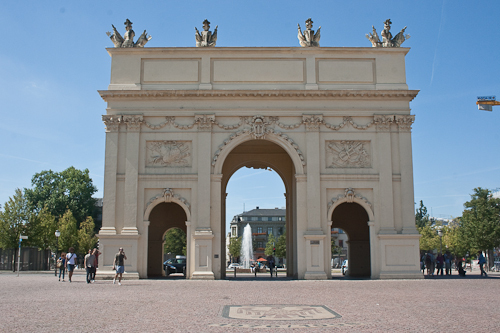 At the western end of shop-lined Brandenburger Straße is the Brandenburger Tor, a gate resembling a Roman triumphal arch that curiously, has two different façades designed by two different architects. 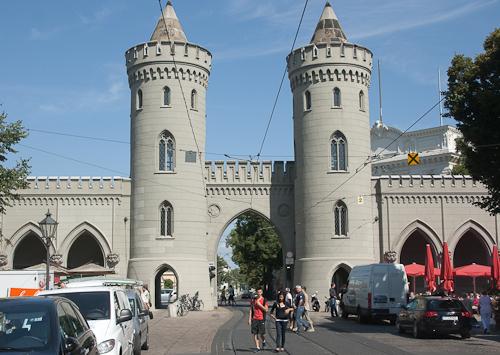 I hit up the produce market in Alter Markt and perused the one along Nauener Tor, one of three preserved gates in the city, and a splendid example of the influence of English Gothic Revival architecture. 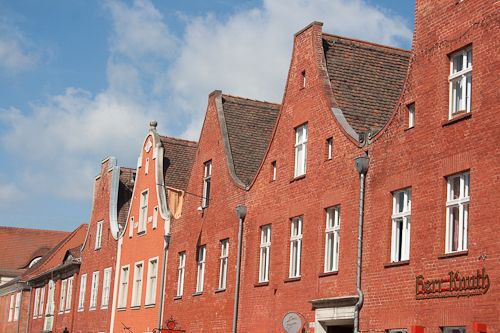 Holländisches Viertel (Dutch Quarter) is an ensemble of some 150 red brick buildings concentrated within four city blocks, Europe’s largest collection of Dutch-style houses outside of the Netherlands. The ‘Soldier King’, King Frederick Wilhelm I, ordered them built (1734-1742) under the direction of architect Jan Bouman for Dutch artisans and craftsmen that he had invited to settle there. If not to see this unique brand of architecture – with its white trim, shuttered windows, and oftentimes-sweeping gable roofs – then head to Maison du Chocolat, the neighbourhood’s undisputed ‘go-to’ for hot chocolate.